Lexington, KY - The Florida Department of Agriculture has confirmed the positive diagnosis of Equine Herpes Virus 1 (EHV-1) in horses in Florida. Six of the confirmed cases are linked to the HITS competition in Ocala. An additional horse in the Wellington area (with no identified direct or indirect connection to the Ocala show grounds) has been tested and found to be EHV-1 positive. The equestrian community is being advised of the importance of horsemen implementing good biosecurity protocols that should be routine when attending competitions or visiting other venues where horses of different origin and disease status are congregating. If planning to travel to such venues, make certain you contact the venue prior to travel to understand what biosecurity measures have been imposed. Additionally, it is advised that you consult with your veterinarian in evaluating your horse's current vaccination and immunity status and to review or develop an individual biosecurity plan. The California Department of Food & Agriculture has published a bio-security tool kit at this link: http://www.cdfa.ca.gov/ahfss/animal_health/equine_biosecurity.html. Dr. Stephen Schumacher, Chief Administrator for the USEF Drugs & Medication Program describes this as a "good comprehensive resource compiled from a number of sources." Eatonton’s Mary Kathryn Clark has another honor – she is among the riders expected to represent the United States in France in July at the 2013 Federation Equestre Internationale’s World Junior and Young Rider Championships in France. Clark, 18, is ranked second in the FEI for endurance riding. The ranking puts her on a short list of riders who have qualified for the world championships by competing in four international races by this May. Clark’s teams have always included her mom, Peggy. This year, if afforded the opportunity, Clark said her father will be traveling with them for the first time. Clark said the event will be held in Tarbes, France, a mountainous region that she expects will offer a wealth of riding experiences. 2001 AERC Hall of Fame horse Mustang Lady, owned and campaigned by Naomi Preston, turns 33 this year. "She was my once-in-a-lifetime horse, my pride and joy," Naomi says. In the 32nd annual Twenty Mule Team on February 23, 2013 near Ridgecrest, California, Jackie Bumgardner reached 30,000 AERC miles on her gelding Fire Mt Zane, whom she bred and raised. Jackie is one of the top ten high mileage riders in AERC lifetime miles. Robert and Melissa Ribley manage the 20 Mule Team, a ride which Jackie used to manage. Additionally, Definetly Spice, ridden by Gretchen Montgomery, reached 4000 miles with their completion in the 100-mile ride. It was Spice's first 100-mile completion. Riding a horse on narrow trail with sheer cliff on one side and straight drop-off on the other isn’t for the faint of heart. Navigating such terrain safely, riders employ their considerable skills and also put great trust in their horses. A misstep can mean tragedy. That’s the challenge Tracy McIntosh of Glidden accepted this summer when she and her 14-year-old Arabian horse, Amigo, who’s already proved himself to be a survivor, participated in the annual Tevis Cup in California, considered to be the country’s pinnacle of endurance horseback endurance racing. Riders push to complete the 100-mile course that steers riders and horses through highly demanding of terrains — mountain, canyons and switchbacks — within 24 hours. Tevis Cup began shortly after 5 a.m. Aug. 4, at Robie Equestrian Park near Truckee, Calif., crossed the Sierra Nevada Mountains and finished at Gold County Fairgrounds arena at Auburn. Right off the bat, riders climbed from 6,200-foot elevation at Squaw Valley to 8,750 feet at Emigrant Pass. For McIntosh, that was a grueling start but also a favorite part of the ride. “That was really beautiful climbing. And the scenery was beautiful up there,” she says. Indeed, the course’s dramatic changes in elevation was one of the biggest challenges for McIntosh and Amigo. With the cliffs, canyons and dropoffs, the Tevis Cup course has a lot of other features McIntosh doesn’t normally see. Danger adds to the challenge. Dr. Richard Barsaleau, a veterinarian and noted equestrian who championed care for horses as a competitive rider, teacher and poet, died Feb. 13 at 87. He died in his sleep after receiving an X-ray test at a hospital for a complaint of chest congestion, said his son Dean. The X-ray showed no problems, his son said. Dr. Barsaleau was widely recognized as an authority on the care of horses, especially in the sport of distance riding. He was a longtime veterinarian and judge for the annual Western States Trail Ride, also known as the Tevis Cup Ride. Meanwhile, he competed 16 times in the 100-mile ride from Lake Tahoe to Auburn, finished 14 rides and won three top-10 awards. He judged horses professionally for many years and was a lecturer and clinician at horse events in the United States, Canada and Australia. He wrote a handbook for veterinary judges and many articles on equine performance, training and conditioning. Dr. Barsaleau also co-founded and served as director of the animal health technology program at Cosumnes River College from 1972 to 1989. He invited students to practice skills at his Loomis home, where he raised and trained Arabian horses. "He could be gruff because he was an ex-Marine, so you kind of toed the line his way – but it was a good way," said former student Cheryl Buch, a registered veterinary technician. "He set a high reputation for Cosumnes River College, and our students are recognized all over the state..."
As part of the Equine Land Conservation Resource’s (ELCR) ongoing regional forum series, ELCR is partnering with the Virginia Horse Council (VHC) to present a special one day educational forum on March 16, 2013 at Blue Ridge Community College in, Weyers Cave, Virginia. The event, sponsored by Bayer Animal Health, USA Equestrian Trust and Weller and Associates Insurance, will be held in conjunction with the VHC Annual Meeting and Awards Luncheon. Afternoon concurrent break-out sessions will be offered in the following topic areas: equine health, equine land conservation and emerging industry issues. A special full day youth track will be offered for ages 9-18 years. From the vision and insight of four mountain men was born Back Country Horsemen of America, the nation’s leading organization in our fight to preserve our right to ride horses on public lands. In 40 years, a handful of folks has increased to over 13,000 members from over 185 chapters and affiliates in 26 states. The seeds of BCHA were planted in the late 60s and early 70s. As hiking, mountain biking, and other trail uses rapidly grew, the general sentiment toward horses on public lands soured. Pack and saddle stock were quickly restricted to a few particular trails or prohibited altogether. Four friends from Montana — Roland Cheek, Ken Ausk, Dennis Swift, and Dulane Fulton – could see the future on the horizon. They knew they needed an organization of horsemen to represent the interests of back country horse users on matters regarding public lands. Gathered around the fire at Roland’s hunting camp in the Bob Marshall Wilderness of western Montana, they brainstormed and developed a vision for a new organization and a course of action for it to follow. They also arrived at three basic principles which have guided BCHA since its inception: 1) become involved in public land management issues that affect recreational stock use; 2) participate in volunteer programs on public lands that enhance riding opportunities; 3) educate horsemen in low impact methods of using stock on public lands. The founding members presented their ideas to local officials of the Flathead National Forest (Montana), who endorsed the concept and encouraged them to proceed. 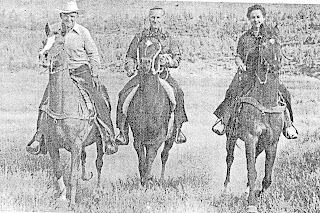 The founding members gathered community support and at a public meeting on January 17, 1973, officially formed the first Back Country Horsemen organization. True to the principles of the new group, they immediately became involved in wilderness issues and volunteer programs related to equestrian use. The idea of a united voice speaking for the interests of stock users spread throughout Montana and Idaho during the 1970s. Around the same time, the Washington State Horsemen and the High Sierra Stock Users Association of California, both with similar goals and objectives as the new Back Country Horsemen organizations in Montana and Idaho, became interested in affiliation. In 1986, a constitution was adopted by representatives of all four states and the organization officially became Back Country Horsemen of America. In the years since then, BCHA had addressed a variety of issues at the local, state, and national levels, including forest management, wilderness use, the US Forest Service’s Limits of Acceptable Change process, invasive species, stock restrictions, user fees, trail closures, outsourcing, sale of public lands, endangered species, agency funding, and more. BCHA takes an active role on these issues and helps shape outcomes that will benefit recreational stock use as well as other trail users. The path hasn’t always been a smooth one. Despite their reasonable expectation of fairness and cooperation, BCHA’s efforts were at times rebuffed. A prime example is the US Forest Service’s poorly conceived trails classification plan that failed to consider horse use almost completely. After many unsuccessful efforts at communicating this problem, Back Country Horsemen of America finally filed a lawsuit in 2005. A federal judge ruled in favor of BCHA to give horsemen across the country a say in how pack and saddle stock trails are managed. From the very start, Back Country Horsemen of America have been folks who believe in giving back. They find ways to volunteer their time, manpower, horsepower, and money towards projects that benefit the community and keep public lands open for recreational stock use. The quality and scope of this work is truly outstanding and includes cleaning trails after storms; blazing new trails; hauling in materials for the construction of bridges and camps; preserving historic trail structures; public education about enjoying and protecting America’s wilderness lands; picking up litter (including a junk car and a World War II bomb); food drives for local food banks; stocking fish; rescuing ill and injured hikers; and so much more. Many of these projects, although performed by horsemen, benefit all trail users and the wilderness in general. Often, BCHA does these projects in cooperation with other organizations, such as the US Forest Service, Bureau of Land Management, state divisions of natural resources, Sierra Club, The Wilderness Society, Colorado Plateau Mountain Bike Association, Wyoming Wilderness Association, Washington Trails Association, Pacific Crest Trail Association, Montana Conservation Corps, Capon Valley 50K Run (West Virginia), Continental Divide Trail Alliance, Tennessee Wildlife Resources Agency, Trout Unlimited, and Southern Appalachian Wilderness Stewards. It is doubtful that any other organization in the country donates as much to our public lands as BCHA. The numbers alone are staggering. In 2011, Back Country Horsemen across the country donated 326,347 hours to volunteer activities. The total value of the “grunt labor,” vehicle mileage, stock hauling, pack and stock used, and equipment and supplies used during those hours was nearly $11 million. During the past 17 years BCHA has contributed $74 million of service and 2,970,000 hours of time. Is your favorite trail well-maintained? If so, you can probably thank a Back Country Horseman. Back Country Horsemen of America is celebrating their 40th anniversary throughout 2013 with events and activities at all levels of the organization; chapter, state, and national. Some special activities are scheduled during their annual national board meeting in April in Rapid City, South Dakota. Fitting for the occasion, the festivities include educational clinics (one will be given by a US Forest Service Lead Packer), meet and greet gatherings, and recognition of the folks who have helped make BCHA the amazing organization it is today. The Back Country Horsemen of Idaho are seeking to have one of their favorite destinations declared a disaster area. Fed up over the lack of trail clearing and maintenance in the Frank Church-River of No Return Wilderness Area, the group is behind House Joint Memorial No. 1 which would declare the 2.3 million acre wilderness a natural resource disaster area. They say the memorial is an attempt to point much needed attention at a problem that too few Idahoans know about. It's not about getting more money for trails at a time when budgets are tight. Rather, they contend, its about U.S. Forest Service making trail work a priority. "Our play isn't asking for more money from Congress..."
On January 28, 2013 The Unwanted Horse Coalition (UHC) and the American Competitive Trail Horse Association (ACTHA) joined forces to help the over 700 rescues listed with the UHC. "ACTHA will facilitate rides for as many rescues that want them and donate all the net proceeds to the rescue and the UHC to continue their valuable work," stated Tom Scrima of ACTHA. And it looks like the rescues are ready! With only 12 days into the effort preliminary interest from the rescues is high. "We're getting about a 20% return from our initial contacts within a small test sector of the rescues. Rides are being scheduled almost every day since the original announcement. We've added staff to help with the phones and have dedicated our top trainers to make sure the rides are a success," says Robin Tilghman, Director of Special Projects for ACTHA. The effort is planned to go on for the year 2013. ACTHA and the UHC are planning on hundreds of rescues to take them up on the offer which not only supplies funding in the short term but also acts as a funding fishing pole. This results from the rides being repeatable whenever there is a need. With the initial responses it would seem to indicate that up to 500 rides with over 15,000 horse and riders partaking is likely. All made possible by thousands volunteers from Coast to Coast, and ACTHA. "We need sponsors interested in being a part of this cause. There will be a lot of eyes on the effort," said Scrima. The UHC is a broad alliance of equine organizations that have joined together under the umbrella of the American Horse Council to reduce the number of unwanted horses and to improve their welfare through education and the efforts of organizations committed to the health, safety, and responsible care and disposition of these horses. For more information about the UHC or unwanted horses, please visit the UHC website at www.unwantedhorsecoalition.org or contact Ericka Caslin at ecaslin@horsecouncil.org (phone: (202) 296-4031). The UHC website has a list of facilities that accept horses, additional assistance for horse owners in need, free downloadable materials about unwanted horses, and information about owning responsibly. Back Country Horsemen of America, the organization leading the fight to preserve our right to ride horses on public lands, has experienced a changing of the guard. The legendary Dennis Daily recently retired and endorsed Randy Rasmussen as his replacement as Advisor for Wilderness and Recreation. Dennis and Randy met a number of years ago when Randy was working with American Hiking Society and trying to convince them to “work with the horsemen.” In 2008, Randy made sure BCHA was involved in a conference focused on traditional or “quiet” trail use. Since then, Randy and Dennis have been working together to bridge the gap between hikers and horsemen. When it came time for Dennis to hand over the reins, Randy seemed a natural fit. He comes to Back Country Horsemen of America with a wide range of skills gained throughout his lifetime of interest in protecting both the environment and our ability to enjoy America’s beautiful wild places. He earned a Master’s degree from Colorado State University in Natural Resources and Recreation, emphasizing Wilderness Management, and he has over 12 years of experience developing partnerships to protect traditional forms of recreation and to conserve important landscapes. If you have any questions contact John Michels, Trail Programs Manager, at 301-565-6704 x 208 or JMichels@americanhiking.org . Ruth "Bazy" McCormick Tankersley, renowned Arabian horse breeder and the founder of St. Gregory College Preparatory School, died Tuesday at her home. She was 91. Tankersley bought her first purebred Arabian horse when she was 19 years old and opened Al-Marah Arabians in her early 20s when she and her husband moved to Tucson in 1941, according to Star archives. Tankersley moved the ranch to Maryland in the 1950s but returned to Tucson in the mid-1970s. In 2001, Tankersley bequeathed the 85-acre property at 4101 N. Bear Canyon Road to the University of Arizona, which will continue to use the property as a working ranch. Tankersley also helped found horse breeder organizations, created a program to train young horse lovers and was a supporter of Therapeutic Riding of Tucson, known as TROT, a program that helps children with disabilities ride horses. "You see, I come from that old-fashioned background of noblesse oblige: If you're born with money, you have an obligation to do good works for others," Tankersley said in a biography. "Only in recent years did I come to feel that through Arabian horses I might do more for my fellows than in any other way." Saturday, March 9, 1-3: USA Chef d'Equipe Emmett Ross will be presenting "International Endurance, Past and Future: Where Are We Headed?" AERC/USEF committee meetings will be held Saturday morning 8-noon. TBA: Jan Stevens will speak to ride managers interested in hosting FEI competitions. Complete schedule available at the convention! The convention is a fabulous two days of endurance, endurance and more endurance! It's a wonderful place to see old friends, meet new ones, and check out all the latest endurance gear at the always-terrific trade show. USA Young Riders: Interested in riding a 1* or 2* FEI event? AERC International's new program allows a $50 ride entry fee subsidy for the first event and $20 for subsequent events (as long as funds are available). If you're a young rider and are interested, fill out the 2013 Young Rider Incentive Program form or see the form for contact information if you have any questions. n December, Cole Still lost his lovely bride, Charlotte, she was 86. Just less than two months after Charlotte's passing, Cole, 93, joined her in the great beyond. They had wed in October of 1942, and had settled in the Prineville, OR. in 1948 with their daughters Connie and Carolyn. In 1973 the Still's rode the Pacific Crest Trail from the Columbia River to the California Border in 17-1/2 days, setting a new record for that accomplishment as no one had previously ridden it in less than 20 days. Charlotte and Cole rode many rides back in the old days of AERC and PNER. Cole and Charlotte were there helping Lew Hollander and Elwin Wines form PNER in 1972, and Cole always said that he was PNER's oldest member. In 1974 Charlotte and Zella Hai placed 11th on the PNER Top 15 Senior Riders. In 1975 PNER gave out awards to the Top 25 and Charlotte placed 5th while Cole was 22nd; Charlotte also placed 17th on the AERC National Top 25 that year. I met Cole and Charlotte in 1977 when I began endurance riding. What characters with a great sense of humor. They were truly kind, helpful people and also great competitors. When we first met Cole, he worked at the mill North of Prineville. He had built a corral there by a shed and rode his horse to and from work every day, 16 miles round trip. No wonder the man and his horses were so tough! Another large search is scheduled today to search for Maruf (aka Magoof), the endurance horse owned by Robin Schadt who disappeared into the forest in Levy County during an endurance ride on January 12. Missing since January 12, the gray gelding was wearing blue tack when he dumped his rider and disappeared in the Goethe State Forest near Tidewater Campground in Dunnellon, Florida (Ocala area). The Colorado Department of Agriculture is investigating one confirmed case of equine herpesvirus-1 (EHV-1) within the state. A quarantine has been placed on seven horses, including the index case, and a hold order has been placed on six additional horses who might have had direct contact. The affected horse, a 6-year-old gelding from Texas, is part of a team of Quarter Horses used during the National Western Stock Show (NWSS) rodeo (which took place Jan. 12-27 in Denver) to pull a stagecoach during rodeo performances. The horse began showing clinical signs of disease Jan. 27 and was transported to the Colorado State University Veterinary Teaching Hospital for diagnosis and treatment. The EHV-1 diagnosis was confirmed Jan. 28. The affected horse is isolated and in stable condition. The other horses from the team are under quarantine at the NWSS coliseum and hold orders have been placed on other horses who might have had direct contact. "The department is taking quick and appropriate actions to investigate, control, and mitigate this disease," said Colorado State Veterinarian Keith Roehr, DVM. "We will continue to trace the potential contacts of this horse in order to protect Colorado's equine industry." The affected horse was housed in the coliseum at the NWSS from January 7 to 28. Neither the gelding nor the rest of the team had any contact with horses being housed and shown in the Events Center and the Hall of Education. Horse owners who traveled to the NWSS and participated in events in the coliseum are urged to monitor their horses for clinical signs and contact their veterinarian immediately if their horse becomes ill or has a fever. Owners who have horses with clinical signs consistent with neurologic EHV-1 infection should consult their veterinarian. Although it's not transmissible to humans, EHV-1 is highly contagious among horses and camelids, and it is generally passed from horse to horse via aerosol transmission (when affected animals sneeze/cough) and contact with nasal secretions. The disease can cause a variety of ailments in equines, including rhinopneumonitis (a respiratory disease usually found in young horses), abortion in broodmares, and myeloencephalopathy (EHM, the neurologic form). Myeloencephalopathy is characterized by fever, ataxia (incoordination), weakness or paralysis of the hind limbs, and incontinence. Should a horse with potential EHV-1 exposure display any of the aforementioned clinical signs, a veterinarian should be called to obtain samples and test for the disease. EHV-1 was also diagnosed in Douglas County, Colo., in 2012. In early May, one horse tested positive for EHV-1. Prior to exhibiting signs of the disease, the affected horse had recently traveled to Colorado from Iowa. The Douglas County horse was euthanized after showing severe neurologic signs associated with the disease. Three young horseshoers were recognized for outstanding career progress in the equine footcare field during the recent 10th International Hoof-Care Summit in Cincinnati, Ohio. These individuals were honored as Rising Shoeing Stars in a program that promotes the importance of further footcare education while encouraging young shoers to succeed in their careers. The program is co-sponsored by six outstanding equine footcare industry suppliers that include G.E. Forge & Tool, Delta Mustad Hoofcare Center, Life Data Labs, Purcell Farrier Supply, R.J. Mathews Co. and Vettec. This year’s program honored three outstanding farriers who graduated from horseshoeing school in 2009 and have spent the past 3 years establishing their equine footcare careers. The first-place farrier received $1,000 and had his expenses paid to this year’s International Hoof-Care Summit to accept the award in front of the industry’s leading footcare professionals. Two runners-up each received $500 awards. Jake Giguere of Smithers, British Columbia, is a 2009 graduate of the Pacific Horseshoeing School in Plymouth, Calif. He handles the footcare work of 300 horses in Northern British Columbia and works closely on therapeutic shoeing concerns with most of the equine veterinarians located within 75 miles of his home. Already on the road to becoming an outstanding farrier at a young age, his goals are to provide a good living for his family, earn the respect from clients and equine veterinarians and enjoy industry recognition as an excellent farrier. Justin Court of La Grange Ky., is a 2009 graduate of the Kentucky Horseshoeing School at Richmond, Ky. Specializing in Thoroughbred footcare, he grew up around racetracks and breeding farms. Along with his trimming and shoeing skills, he attributes much of his success to being able to stay calm, cool and collected in his daily work. Wayne Whitson of Viola, Del., is a 2009 graduate of the Lookout Mountain Horseshoeing School in Gadsden, Ala. While he handles footcare work with many types of horses and has done some training of horses, he’s working toward specializing in the footcare work of Standardbred horses. Nominations for next year’s 2014 Rising Shoeing Star program are now being accepted. To nominate a young farrier who graduated from a horseshoeing school in 2010, send a two- or three-page letter explaining why he or she is a candidate for a “Rising Shoeing Star” award. Mail your nomination to American Farriers Journal, P.O. Box 624, Brookfield, WI 53008-0624 or email it to lessitef@lesspub.com prior to Aug. 31, 2013.